By Katía Truijen, December 3, 2014 at 1:40 pm . 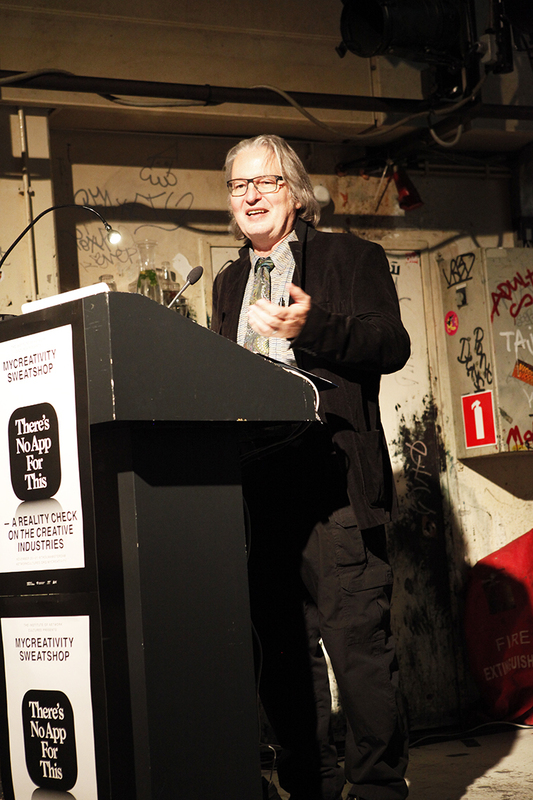 In his performative talk, Bruce Sterling uses the music industry as a lens to take a closer look at the creative industries. According to Sterling, no matter what happens, it happened to musicians first. For instance, musicians were the first to adapt to digital realities. Sterling refers to the development of music media, from vinyl to the cd, then over to the mp3, onwards to streaming and then back to vinyl again. Despite the music industry’s ability to adapt to the digital age there is still no sustainable revenue model for musicians. However, Sterling argues, the music industry was in fact never there for the bands in the first place. Those who profited were always the record stores, the booking agencies and other representatives. Musicians have always been marginal figures, he states. Sterling goes on to say that back in the day you could still discover new kinds of music genres, but now just a few artists dominate the top of the industry for several years making the same sort of music. The music industry, he argues, is in collapse: new microgenres emerge, but there are no new genres. Instead, we are confronted with a retro mania. Sterling compares the music industry to the Amsterdam souvenir industry: nothing new is ever added to represent the city; wooden shoes are still being sold and have been sold for decades. If it’s true that the music industry is not really developing anymore, what would help the industry to regain its energy again? Sterling describes a couple of scenarios. He takes the singer Cata Pirata as an example. If one would asks musicians like her what they want, there is a big chance that they would reply that they want to be a star in the first place, and sell many records. This, Sterling argues, won’t help the music industry to innovate. In a second scenario, one may set up a union for artists to improve their working conditions. However, Sterling posits that this doesn’t help to improve the image of the independent artist, as a city sponsored orchestra is simply not that interesting to the audience. A third scenario would offer grants to talented musicians. Sterling argues however that sums of money do not make musicians more creative. Money itself simply won’t help musicians make better music or become more interesting cultural figures. So this too will not amount to much. Another tactic would be to crowdfund musicians. But according to Sterling the crowd often lacks imagination. Most projects that are rewarded simply have a good crowdfunding pitch. In yet another scenario musicians would run the music industry themselves. But Sterling argues that this would ask of them a completely different set of skills than they are equipped with. A last option would be to give the music industry an infrastructural boost. To rebrand the industry, facilitate cheap rents and create work spaces for creatives. Sterling argues that this is exactly what is happening now. He describes these creative hubs as ‘semi-ruined gentrifiable barns’ and doesn’t think this will help in any way. Sterling continues by giving an example of what he calls ‘a great creative industry romantic story,’ namely the story of Carla Bruni, singer, model and wife of Nicholas Sarkozy. Bruni donates all her royalties to charity because she reportedly doesn’t make music to make money, but because she just wants to participate as a musician. According to Sterling, Carla Bruni is the example of modern European culture. Bruni could be considered ‘a warm hearted aristocrat’ that would probably get more subsidy than an artist like Cata Pirata. 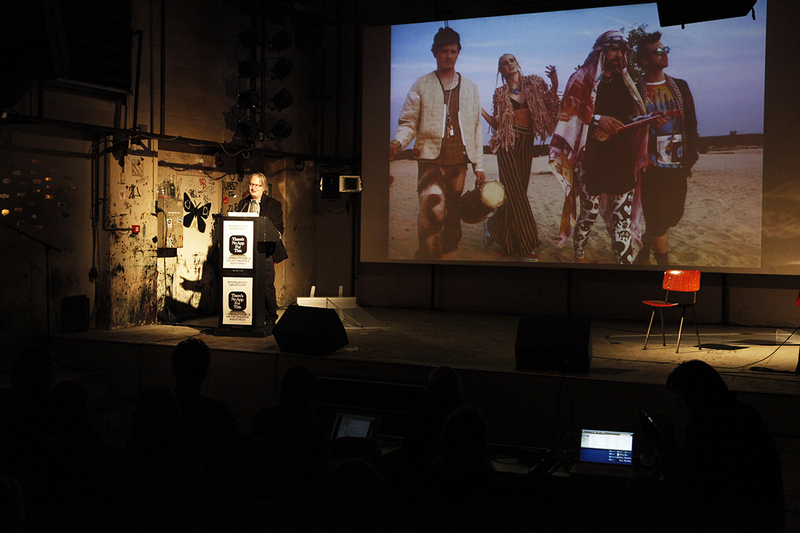 ‘Now that’s the reality check on the creative industries’, Sterling states. Indeed, in the creative industries’ optimistic start-ups are offered more means than critical projects. This way diversity might actually be killed. According to Sterling, the only way to turn this tide is to bring ‘justice’ back to the discussion. But we are simply distracted and preoccupied with discussions on new technologies such as VR goggles, Facebook and the Internet of Things. As a futurist, Sterling is interested in the developments in the Internet of Things. How will old media and (what used to be) new media be integrated into this? And more importantly, who will be in charge of it? Will it be similar to the internet as we know it? Who will program diversity into our homes and streets? And who will be left out? A hint of what awaits us is to be found in the music industry, because ‘in the end’, Sterling argues, ‘everything that happens to musicians will happen to everyone’.